I don’t really know what to say today, but I wanted to at least acknowledge that it’s the third anniversary of the day my Bubby passed away. Jeez. Three years. It still feels like yesterday. It’s no lie to say that I still think of Bubby every day, due in large part, I guess, to the fact that I keep a picture of her at my desk at work and right next to my couch at home. Not that I need the reminders, of course. And until recently, when I got a new cell phone, her number would always come up when I scrolled through the Bs. It was like I didn’t want to let her go. 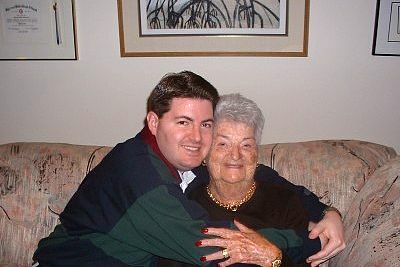 My Bubby was a very special lady, and we were very tight (as I’d imagine all my cousins would say about themselves and her). Every day, either at 8 a.m. as I walked to the train or at 1 p.m. when I went to lunch, I’d call her and we’d talk and laugh. I miss those daily chats. The last couple years of her life, every time I’d leave her, I made sure to give her a big hug and kiss, because I never knew when it would be my last chance to do so, and I was very aware of that fact. When she passed away, I had just seen her days earlier, on Thanksgiving, and we had spoken on the phone not even 24 hours before she left us. Days like today, as much as I take comfort in the fact that Bubby never doubted how much I loved her, and as much as I made an effort to make sure I said a proper farewell, I long for one more chance. What I wouldn’t give to give Bubby one more hug. To talk with her on the phone one more time. To tell her how much I love her. Oh well. 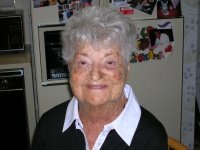 I really miss my Bubby, and today, on the third anniversary of her death, I wanted to you all to know that. At what point do you remove someone from your cell phone? I asked myself that question again this morning as I thought about my Bubby. 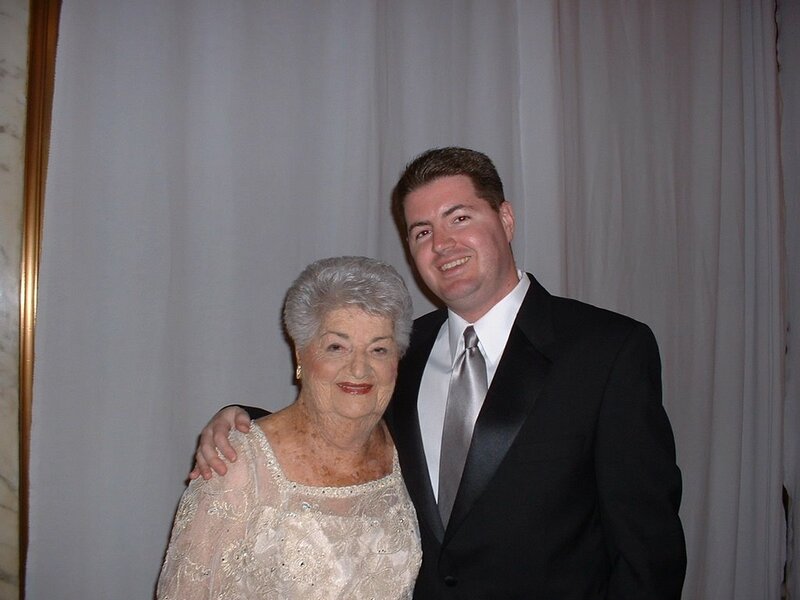 Today is the two-year anniversary of her death, and I still find myself wanting to call her every now and then as if she’s still with us and might actually answer the phone. Of course, I know that’s not true (heck, I know there’s not even an answering machine hooked up to her phone anymore), but it’s just what happens when I scroll through my cell phone and see her there. I’m in no rush to “erase” her, or delete her name from my numbers, so I think I’ll keep Bubby on my phone for a while more. I think what it comes down to is something like what Coldplay sings in their song “42”: “Those who are dead are not dead, they’re just living in my head.” Bubby’s not really gone if I keep her on my mind, as she is today, more so than on other days. I still really miss her. After the rain stopped, Monday was a really nice day. Teflon-coated pots are excellent. One of the best inventions ever. I wish I had given Gossip Girl more of a chance and hadn’t given up on it after the first episode. We’re negotiating, and I should have a decision on the apartment on Tuesday. I’m now feeling more 65-35 as far as excitement and nervousness go. Ben & Jerry’s Crème Brûlée ice cream is so so so good. I’m rooting for a There Will Be Blood Best Picture upset on Sunday. There’s something about seeing baseball players practicing down in Florida, smiling, happy, with the sun shining, that makes everything all right. Are you on Facebook? Why not? Sign on and let’s be friends. Days off would be more enjoyable if there was something good on TV in the morning. At least on Saturdays there’s three hours of repeats of 90210 and two of The O.C. Which is the more annoying instrument to listen to: violin or the flute? I don’t think there’s any movie in theaters right now that I haven’t seen that I want to see. My early American Idol favorites are Amanda Overmyer, a.k.a. : the rocker nurse, and Michael Johns. Kristy Lee Cook is cute, but she won’t get past the top 8. And David Archuleta is overrated. And anyone who sings “And I Am Telling You I’m Not Going” will never win, much less make it to the top 12. Sometimes when scrolling through the names and numbers in my cell phone I’ll come across Bubby and I’ll be tempted to call. I wish I could. Next week, March 1 to be exact, marks the 11th anniversary of the day I moved to Boston. Still the best decision I’ve ever made. I own way way way too many books, CDs, and DVDs. Can’t believe I still haven’t finished The Year of Living Biblically. Kupels went and raised their prices, and in so doing went from being a great deal to a total rip-off. When I move, I think I’m going to hire a cleaning person to come regularly. Some movies I can watch over and over and never get tired of them. The Shawshank Redemption is one of them. Long weekends are great … until you have to go back to work the next morning. 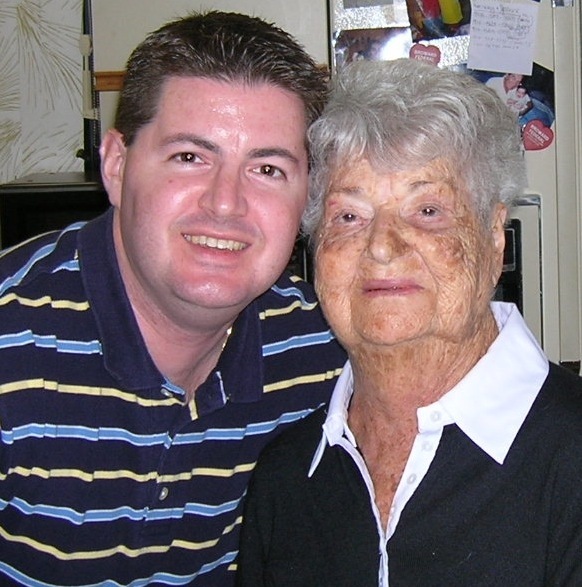 Depending on whether you’re a literal person or not, today is the one-year anniversary of my grandmother’s death. Actually, the anniversary is November 28, but it happened on the Tuesday after Thanksgiving, so I’m choosing to remember her on the blog today. To say that the week of her death was hard is an understatement, and here it is a year later, and while my emotions are certainly more in check than they were then, not a day goes by when I don’t think of her. ‘Bubby’ is still one of the names in my cell phone, and I can’t even count the number of times I’ve scrolled through looking for someone to call and have stopped on her name, considered hitting “call,” and then realized no one would answer. Truth be told, from time to time I still reach for the phone to call her as I walk to the T in the morning and then stop myself. I just miss the conversations we had, the laughs we shared, the good things I could tell her, and the way she made me smile even on bad days. As nice as it was to spend Thanksgiving this year with most of my cousins and my aunts and uncle (the first time so many of us had been together since the week of the funeral), Bubby was missed. I miss her a lot and think of her often. Maybe that’s because I have her picture right above my computer screen at work, and there are pictures of her in my bedroom and living room at home. But I don’t need to see her picture in front of me or find her name on my cell phone to have her on my mind. I just need to remember the good times, and there were plenty of them. It’s one year later, and it’s still hard, but I’ll try to smile today because Bubby wouldn’t want me to be sad. I just miss her so much. 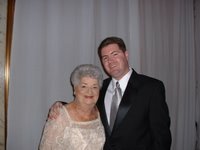 I got such a nice response to my posting about my grandmother’s passing last week (and first of all, thanks for that) so I thought I’d write a quick update/addendum. And then I’ll try to keep things on here a bit more upbeat. If there’s one thing Bubby would have wanted, it’s for me to be happy and not dwell on her passing for too long. It has been an emotionally taxing few days. There was good (my family seems bonded now more than it’s ever been); and there was sadness (can’t remember when I cried as much). Sitting shiva was for me, overall, an enjoyable experience, but it was truly bi-polar: the highs were very high, and the lows were very low. At times it felt more like a party than a somber gathering, which many said was appropriate since we were supposed to be celebrating Bubby’s life. It still felt odd and a bit absurd. I was one of four grandchildren (of seven, total, not including spouses) to give a eulogy at the funeral on Thursday, and apparently, it was so good it might have scored me a date — with someone else who apparently gave a nice eulogy at a funeral recently. One of our family friends thinks that makes us a match. (I can only imagine what I’ll say when I call her.) Oh, and she lives in New York (y’all know how I feel about dating people in Cambridge). Let’s just say I’m not expecting too much there. Of course, the hardest part for me was when the house would get quiet again and the laughter stopped, and all of a sudden all there was to do was look at the pictures and realize why we were there. I’d look over and Bubby wouldn’t be there. I’d want to call her, and she wouldn’t be there. And most often, I’d just want to give her a hug, but there was no one to hug. It’s the silences that are the most painful still. Walking into my apartment Sunday night, I had to put on the radio softly while I ate dinner. And not surprisingly, it was very hard to leave New York Sunday afternoon. I’m actually kind of happy to be back at work today, if only for the constant noise and distraction. 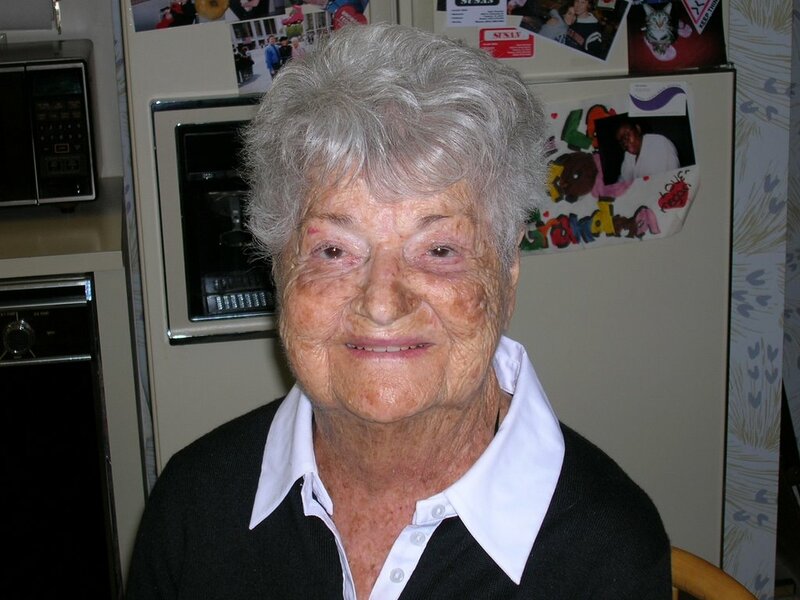 When she died, Bubby was 91 years old. (At least that’s what we’re going to put on the gravestone; there’s some debate about her true age.) It was said multiple times this week that she had a good run: she traveled a lot, made it to my sister’s wedding just like she wanted to (not to mention the weddings of two of my cousins), got to see her whole family in the days before she passed away (minus my cousin who is in Hong Kong), was constantly surrounded by love, and died knowing she was going to be a great-grandmother (sorry, Stacey). Personally, I can say I have absolutely no regrets about my relationship with her, and I’m sure she is somewhere right now thankful for a life well-lived. The pain of Bubby’s loss is still hard, but it’s comforting to know how close my family is now and how good my friends have been during this difficult time. I know I’ll continue to have my moments of sadness, but for Bubby I’ll be strong and will go on with my life, continuing to make her proud.